At my hedge fund we usually short frauds. Stuff with dodgy accounts and dodgy prospects promoted by people who would be car salesmen if stock promotion were less lucrative. But sometimes, just sometimes we find ourselves aching to short a real company with fine management where business prospects are going south very fast. Richemont - the mega-luxury good maker with a focus on watches and jewellery is the latest example. We are waiting for a highly valued high quality company producing spectacular goods to have a similarly spectacular earnings miss. The company describes its brands as "Maisons" (French for houses) harking back to some long established tradition in a Swiss-French mountain chalet surrounded by snow where they produce fine (if somewhat pretentious) luxury goods. Still these brands have taken over the world - and now if you walk through Venice or Hong Kong or Shanghai or around the areas frequented by Asian tourists in Hawaii or Sydney you find the global standard set of luxury goods. The fact that they could make their product both ubiquitous and exclusive somewhat amazes me - but they have achieved that. These are amazing companies. With amazing profits too. The Jewellery Maisons [Cartier, Van Cleef & Arpels] in the (March ended) 2012 financial year produced €4.59 billion in sales with €1.51 in operating profit. The growth rate has been almost Apple-like. In 2007 sales were €2.68 billion, profits €742 million. 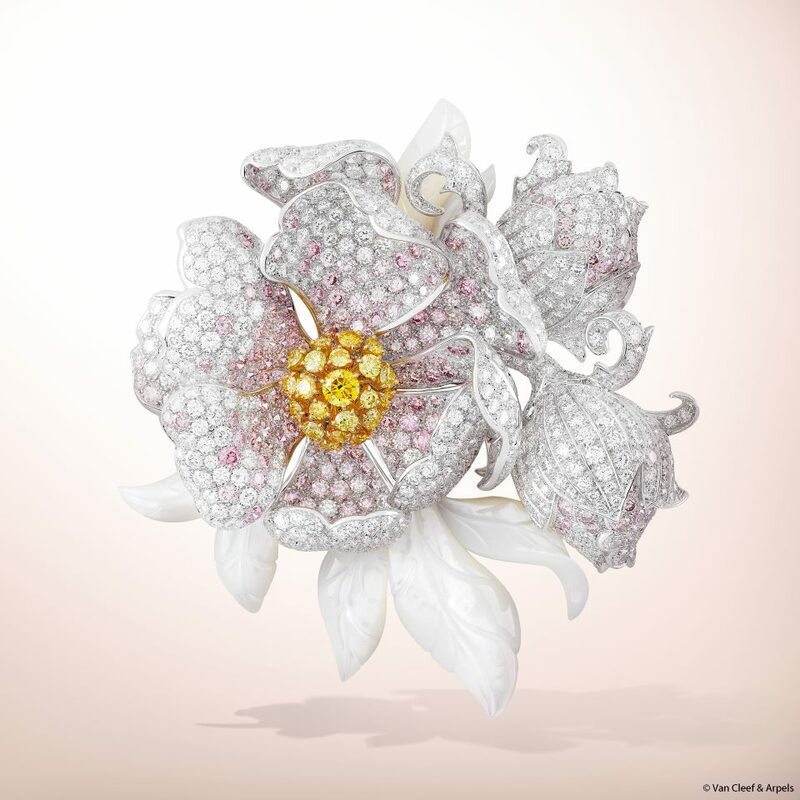 In 2004 the Jewellery Maisons had only €367 million in profit. This stuff did unbelievably well out of the rising of a new plutocracy - but particularly out of a new kleptocratic Asian plutocracy. Watches did similarly well. I find watches strangely redundant (a smart phone is both more accurate and more useful and you probably carry one anyway). However they have become the only really acceptable piece of male jewellery by which the elite can show their status. In these days of business casual (and the studied casual of Ralph Lauren) an Italian tailored suit does not do it. Remember both these products are inferior for purpose to the smart phone already in your pocket. But they do say "look at me" the latter in a particularly Rococo fashion. Moreover a disproportionate amount of the volume - and an even more disproportionate amount of the value has gone to Hong Kong. Hong Kong is the destination for a quarter of Swiss watches by value and an even higher proportion of the most expensive stuff. Why Hong Kong? Because the sales tax rate is lower than China. If you are buying a thousand dollar watch you can buy it in Shanghai. But if you want a half-million dollar watch (no, not kidding) then the sales tax differential makes it worthwhile to fly to Hong Kong, get a nice hotel room and go shopping. That is why the value is in Hong Kong. The Hong Kong market is it - it is the biggest pile of value and the biggest place for the super-pretentious stuff - the stuff with fat margins. This stuff is really Rococo - and Rococo is a style beloved only by rappers and kleptocrats. As I said - this is the stuff of rappers and kleptocrats. And there are far more kleptocrats in China than rich rappers anywhere. There are several data sources I watch to keep tabs on spending by Chinese elite. 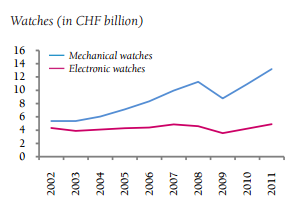 The Swiss Watch data is obvious. Exports to Hong Kong in June were up 21.2 percent. It was about the same in May (but the monthly data has disappeared from the web). It was about the same every other month this year. They keep upping the exports to Hong Kong. Sales growth stopped. However exports to Hong Kong kept up (note that 21.2 percent figure above). The volume growth actually went negative - being negative 3.4 and 3.1 percent for the last two months. What do you do with an inventory glut of hundred thousand dollar watches. You can't really discount them - so they just sit there, looking a little stale and slowly devaluing your brand. And that is why I am short the stock. It is a trading short really - this company is likely to miss earnings and it will miss it in an unfortunate way - they are going to be swamped with inventory. It is not just watches either. 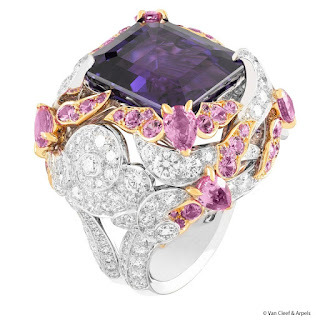 Anecdotally a Van Cleef and Arpels show that was huge last year was distinctly quieter this year. "After a phenomenal year last year, there's been a bit of a slowdown in mainland China," he explained. Fornas added that while Cartier’s watch sales are still increasing, it is not at the same rate as 2011. He declined to reveal figures or percentages, however. But that quote is misleading. He says it is one month worse, one month better. But it is one month worse and the next month bad too. My guess: this company is not being entirely straight with market about how much tougher things are getting. The company will guide down and the stock will be singled out for "special treatment". I am short - just waiting for the bullet. So why did the slowdown happen so sharply? The slowdown in Hong Kong (super) luxury goods is a faster decline than other Chinese data. Why so fast? I have a theory given to me by a China watcher. 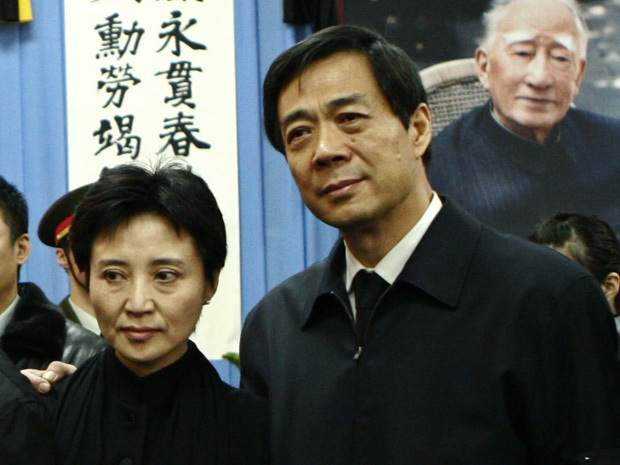 The theory - it turned bad sharply with the ouster of Bo Xilai and now the murder charge on his wife Gu Kailai. Gu Kailai is going to have a hard time avoiding a mobile execution unit. This changes the stakes and it is structural. A half million dollar watch no longer says "look at me". It says "look at me, I am a kleptocrat". Thoughts of that beautiful Van Cleef and Arpels hair clip become the last thing that runs through your brain before the bullet. "When you talk to the people over there, they are all waiting for a new president to come in. That will fuel the economy with fresh money and lower interest rates." But who said the new kleptocracy will love Rococo just as much as the old kleptocracy? Maybe party self-preservation will require less ostentatious displays of wealth. After all ostentatiously showing off wealth to an oppressed billion people does not seem like a way to preserve your power. We know what a completely collapsed luxury good market looks like. Brazilians like a bit of bling. But in the late 1980s and into the 1990s the kidnapping rate in Brazil went skyward. (There is an horrific documentary about that called Manda Bala which translates "send a bullet".) After kidnapping became a major industry (particularly in São Paulo) carrying a $3000 handbag no longer said "look at me", it said "kidnap me". Just saying - when it turns it can get uglier than you ever imagine. John, as you noted this is outside your usual area of interest for shorts. I'm curious as to how you sourced/stumbled upon the idea. Was it looking for watch companies or working down from a macro view of China spending? Thank you for the great reads! John, What are the last two pictures of? Where did they come from? The last two pictures really are Chinese executions - the latter of Tibetan dissidents. I wish they had some leverage. That to me is what prevents me from getting interested in them as shorts. Thanks, excellent post. Seems that China and Sao Paulo are extremes but the "class war" in US is an echo of same. My A. Lange & Sohne has been in the safe deposit box for over 2 years, apart from potential safety issues, it's just no fun to wear anymore. I'll put it back on once good times return, assuming I live that long. It's German, btw, not Swiss. Their CEO agrees with you, once said, to paraphrase, you don't buy our watch to tell time, that's what a cell phone is for. Amazing, eh? I am curious why you chose Richemont over Swatch? The latter has a higher share of greater China (incl Hong Kong) sales - 38% vs 27% for Richemont. Swatch shares gained 4.8% since reporting Q2 on July 24 vs 4.5% for the SMI by the way. I’ve looked at Richemont. I became interested in this company because it traded at a discount to other luxury brands despite showing higher sales growth. The value pitch for this company is pretty straightforward. It trades at a discount to its peers. It owns a number of highly desirable luxury brands, most of which have been around for 75 years or longer. It is the only luxury company that has a good in-house e-commerce strategy. However, a huge chunk of their revenues derive from what you astutely call ‘Roccoco’. The reasons for purchasing such big ticket items differ materially from purchases of handbags or silk ties. Buyers treat it like purchasing an asset class and not as discretionary spending. Indeed, I remember reading an interview with CEO Johann Rupert where he stated that he was personally acquainted with buyers who have spent over $100 million annually on Cartier. As an asset class, Richemont’s Roccoco is tangible, easily transportable, easy to hide and, thanks to the brand familiarity, relatively easy to sell on. If purchased at an airport there are no sales taxes either. Owning a Cartier collection makes for a pretty good “getaway stash”. Not being able to wear jewellery in public is therefore not really an issue. It wasn’t intended for display to begin with. More so, Bo Xilai discredited the neo-Maoist movement more than anything else and something tells me that they weren’t big on peacocking. How Richemont fares from this point on will be primarily determined by how its products fare as an asset class. The Chinese slowdown in asset inflation will probably hurt it more than any of the reasons that you have stated. An increase in the attractiveness of alternative asset classes will too. As long as there are nouveau riche, they will buy bling. The difference vs. Sao Paolo is that in Beijing, the people who buy the bling are the ones with the guns and the tanks, and shoot the people who would take them. In a police state, your bling is safe. A regime that can manage a transition from near-feudal conditions to being the best manufacturer of the most high-tech products has a pretty good chance of managing a transition to less export- and infrastructure-led growth. Despite corruption, the Chinese government delivers the goods to the people in vastly improved standard of living, literacy, medical care. When people's hopes are met, and protests are heard, there is no revolution. When people's hopes are disappointed, and protest is suppressed, then there is risk of revolution. The leadership has a lot of legitimacy, since no one can argue the Chinese people have not 'stood up'. Compared to the standard of living and freedom in the US, China looks wanting. Compared to anything anyone alive has experienced in China, they're witnessing a miracle. There is no tradition of popular democracy. There is no tradition of successful popular revolution (except the Communists). In the short run you may very well be right that luxury growth will decline, but I think the burden of proof is very much on those who predict a really spectacular blowup . This is an interesting conversation. To add to what John wrote, about 9 months ago I met with the CFO of one of HK's largest publicly traded jewelery retailers. I was shocked with how open he was talking about his VIP customer base contributing a large portion of their high ASP purchases. He walked me through why these government officials would be purchasing these ultra-luxury items. They will embezzle cash over to HK and purchase for example a $100,000 watch or even better a $100,000 diamond as it's easier to hide than the cash. These transactions occur in HK because there's a 17% VAT as well as a 13% luxury item tax in the Mainland. Instead of losing $30k in additional tax you are glad to spend a $1k to fly to HK. Another interesting aspect is that we've seen strong inflation in these ultra-luxury jewelery products. The game of price inflation is tolerable as long as an increasing amount of money is embezzled out of China by kleptocrats, thus keeping prices on the rise. If these officials think prices will collapse due to less being embezzled then they themselves will hold back as well. This CFO expected sales to slow down into the transition but didn't think it would be a dramatic fall. (Even if he did he would be a fool to say that). It'll be interesting to see what happens. Anyways that's my 2 cents. Having worked at a large luxury goods company recently (diamonds) I can tell you that the demand for this stuff is alive and well. You may be right about a downturn in China (although it could just be a change in fashion--which will lead to renewed demand by rendering old watched obsolete), but there's plenty of countries with kleptocrats around nowadays. If Hong Kong has a downturn, maybe the top Russian destinations will do better. I'm looking for a chance to buy Richemont, so we're both hoping the stock price tumbles. I think your talk of a revolution is overly dramatic, a normal downturn/recession will do the job nicely enough. Good call spotting the HK tax receipt trend. I guess I am less convinced that things like gaming are as bulletproof as Chanos likes to think. Firstly, look at Macau casino revenues (get the Macau statistics) and look at how correlated it is with fixed asset investment. Why? Because you need to have a big dumb government boondoggle to over invoice to get the money in the first place. You then blow it in Macau and whatnot. I think people are slowly but surely working out that much as the US was "one trade" with housing from 2003-2008 the correlation in China is a lot higher than you'd think too. On Russian backup demand for luxury goods I just don't see it. Sure watches are high value and fungible (bid offer on a Rolex Oyster is tighter than a lot of distressed bonds) but are kleptocrats going to fill the gap? - How much of the wealth in Russia, Brazil and the like over the last decade was investment driven? - How are these underlying commodity markets faring with the increase in supply and Chinese slowdown in demand? Badly. - Will they see radical increase in demand from here or gradual demand destruction and supply side pressures. I think the latter - as iron ore miners. Only tasteless thieves of natural resources wear a 50k watch and that's where the money is. I'd be fascinated to get a breakdown of profits by model but my understanding is that these companies are much more leveraged to a certain kind of demand than you'd like to think. John, I think your understanding of china is largely correct. On luxury spending, one prior comment could be correct - it's an asset class instead of a good. A middle level official can easily own 10 Beijing apartments. If a portion of this becomes watches, it will be a lot. I am sure you already know, another indicator is Macau casino volume. really brilliant idea, I was thinking about shorting luxury stocks as well. As one commentator already mentioned, Richemonts stuff could be used to transfer wealth out of China easily. On the other hand, as soon as a hear someone declaring "this is a nwe asset class", my instincts tell me to short this. So a cmpromisecould be to look at companies like Prada or Boss, which might be impacted as well but whose products cannot really be used to transfer wealth. About your question on what to do with unsold stock. While you are correct that the store can't discount it, there is a thriving grey market in these watches where another party sells the watch at a discount. These sales aren't "official" - i.e., they can' tbe serviced by the factory - but they are good enough for most people. Also, one of the reasons this market exists is because authorized retailers are forced to buy a certain number of watches a year in order to keep their status. I don't know a ton about it but I'm sure one of your other readers can fill you in with more details. On a similar company in the design, manufacturing, wholesale and retail sector, how did you miss having a position on the short side in one of the biggest busts in Australia and the world?. And what do you make of the attempts by executives and directors at a turnaround. And the subsequent bids by TPG? A quick perusal of some watches on the auction houses (Christies, Sothebys, for bigger volume models eBay) suggest taking a loss of 50-75% or more on the retail purchase price when reselling. Yes there are a few rare pieces made recently that have appreciated but most seem to depreciate and depreciate rapidly - suggesting most of the value is being captured by the manufacturer. Good for them, bad for "investors". Re HK data sources, you say "But Hong Kong also has sales tax data". Hong Kong has no sales tax. The Census and Statistics data you referred to is retail sales data. It is gathered from "a scientific sample of 3000 retail outlets...each month." The Chinese are not buying the watches now. They are buying gold and more gold. Slightly off topic but furthering your discussion on Microsoft, here is another reason to sell up..
Hopefully we will soon expose the QF ponzi too..
Rather like those Vertu phones, encrusted in diamonds and bling.. Same crappy engines from Nokia! Shorting luxury goods? Are all those Saudi princes and Qatari "businessman" suddenly going broke? Get serious. The people with the money to waste on this shite are the least likely to sucked down the rabbit, unless peak oil suddenly starts to bite, then it's everybody out of the water and f--- the stock market. The petty power cliques in the CCP mean almost nothing. This kind of BS is going on all the time, just like in every bureaucracy on the planet. It's just the Chinese are a lot more willing to put a bullet in you if you stumble (just like the Soviets did for decades). It heralds nothing in particular. I am in the high end collectable wristwatch market as one of the biggest dealers in the world. 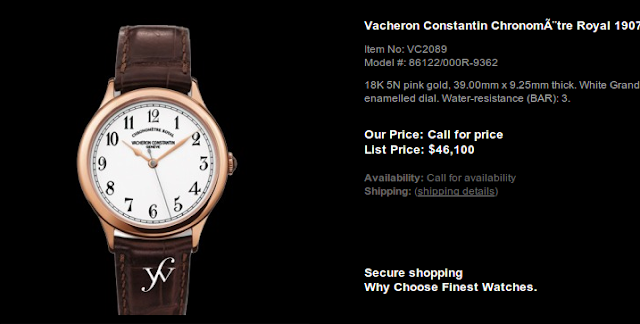 There is no end to the demand for watches, but the pricing is somewhat fluid. My biggest surprise when I started in the business was just how many people there are in the world with the desire and money to buy $50K watches and up. It's worth pointing out that collecting watches is a genuine passion for many affluent and non-affluent people. I have had business and entertainment business icons in my office, examining and talking about watches for hours, like kids in a candy store. We have numerous customers with multiple-million dollar watch collections, and hundreds of customers who buy just one or a couple $50K-$100K watches. China was the most important watch market up until a year or so ago. It was preceded by Russia. But Europe and America have lots of serious collectors. Japan is a mainstay. My point being that there is plenty of demand for expensive watches. Watches being small and easily shipped or transported, tend to find their way into secondary markets when they don't sell at retail. They all end up on a wrist somewhere. I will say that some brands, including the two kings, Rolex and Patek Philippe, which each have raised prices every 6 months or so over the past couple of years, are starting to price themselves out of their respective target customer markets. That hasn't happened before. However, these unsold watches will all make their way into secondary markets, at a discount, and get sold. Importantly, over the past few years, truly collectable watches (generally complicated Pateks and vintage Rolex sports watches) have become a genuine asset class. We have asset managers calling us to buy certain watches for a portfolio. We have wealthy people calling us all the time saying they would rather own a $100K watch than $100K worth of paper assets. Yes, in 2008 the watch market crashed in September. But by 2010, prices were recovered and today, regularly, watches set records at auction. Could the watch market slow down going forward? Yes. If everything else crashes again, it may too. But don't underestimate the passion of many thousands of collectors who will ensure that watches remain as coveted and exclusive and valuable and liquid as always. My comments are meant toward high end (Patek, Audemars, Vacheron, Lange, Breguet) or at least strongly branded jewelry type watches (Cartier mostly) generally. Vintage complicated or very rare pieces particularly do well, even when the rest of the market crashed in 2008. Rolex will take care of itself given its iconic brand. Prices will adjust down in a soft market, but they all sell. Don't forget that the manufacturer makes their money when they sell to wholesale. They aren't hurt by weakness in the retail marketplace, the dealers and wholesalers are. I used to work in asset management. The watch business is a great business, not only because of the financial rewards, nor thanks to the robustness of demand, but because of the passion of the customers and collectors. 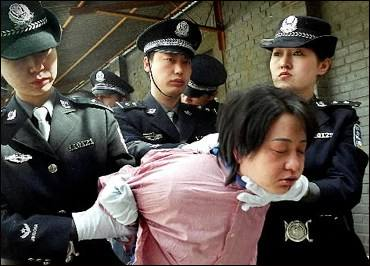 I do not think the average Chinese people care about the executions, they regard them as routine. The game will still be played, only with a couple of promoted players. Same rules and corruption. Why spoil a nice money making article with such an irrelevant photo of people being shot for protesting the invasion of their country. Let's keep focussed on the money making. Reuters symbol for Richemont is CFR.VX. Does anyone know what the symbol is on Interactive Brokers? I don't locate it there using either company name or base part of symbol. What are the typical borrow rates for this name? I am guessing it is not very high. I wish you luck with shorting richemont but I suspect that you've applied logic to an emotional purchase and that there is a huge amount of confirmation bias in your thinking-yes these kleptocrats are repulsive people with cringe making taste but they are not going away. So 212 isn't go to be as good as 2011 but the Cartier brand will go on and on and on. As will Van Cleef etc. There is always somebody somewhere who has had a "result" and wants to scream it to the world. RTS/Anonymous above only gives me more confidence taht the market will slow. This insider has bought into the spin that the market is robust and can only go up. Clearly this is a great sign of a top. "They all end up on a wrist somewhere." This nonsense comment shows how confused this person is. For the same theme you may add RCO FP , this one has a real air pocket to fill. one has to also take into account net-a-porter and the Mr Porter websites. I am not sure how much earnings they give to the top line, but they are growing very fast. It is not only watches that they sell. The comparable short candidate to Richemont is Burberry, not Remy. The Remy chart is very strong in spite of a strong move up. The Burberry chart looks weary and most of the fundamentals there should be similar to Richemont. 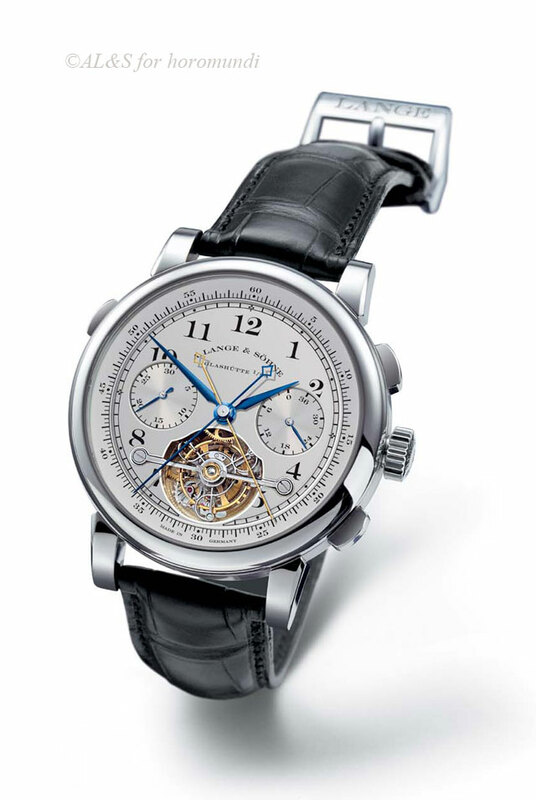 I am really pissed at A. Lange & Sohn. A number of years ago during a stay in China, I bought an AL&S watch in the Shangyang Market in Shanghai. It was a steal at ca. US$30. It broke about a month after I returned to the States. Unfixable. Happily, I'm returning to China next month. I plan to find the guy who sold it to me and make him give me a replacement! Great article. It caused me to recall the use of jewels in HK as currency and bribes with Japanese occupiers in WW2. Barton Biggs had written a piece on that phenomenon that I think he mentions in passing in "Hedgehogs". I started loving the first few paragraphs until I reached the bottom part of the post. Those are hideous and I am not sure of its linkage with watches and luxurious goods. Anyway, you got a thought provoking post. Well I have been long on Richemont for 2 years now and Happy I did so. In the world we're living, the rich are getting richer in increasing numbers (the opposite is unfortunately not true) and I think that strong 100 years old brand will continue to thrive. Because a company like Richemont is not managed by some cowboy hedge funds, that can make 600 M profit one year and be out of business the next, they build over the long terms 5 years minimum, they have no leverage, flushed with cash and the most important Richemont is well placed to enjoy the macroeconomic trends of the world we are living in. I dont know if you still shorting but 21% stock price increase in 4 months, I hope you got out. A correction could happen soon, as 73 SF for the stock is getting expensive, but the long term horizon for the Richemont, LVMH is bright.